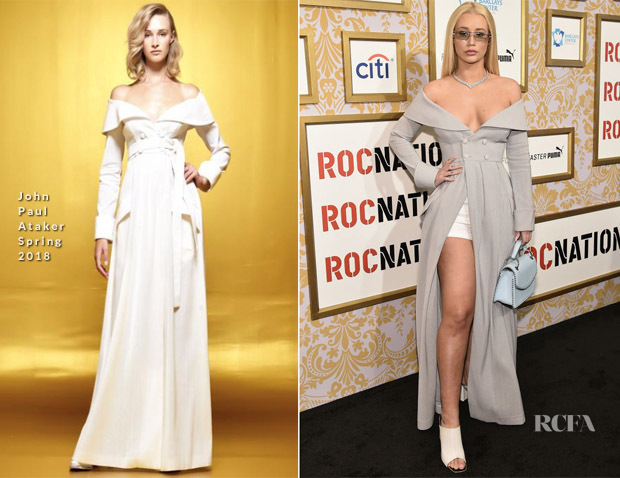 Iggy Azalea attended the annual Roc Nation pre-Grammys brunch at One World Observatory on Saturday (January 27) in New York City. I do like this John Paul Ataker Spring 2018 coat dress which she styled with shorts, but I have some issues with the styling. The necklace feels way too OTT for brunch. I wish Iggy had selected a daintier sandals to elongate her legs. But I do like the idea of the blue Flynn ‘Mercer’ bag as this was a daytime event.